UUP President Fred Kowal, right, greets Congressman Brian Higgins, left, with Buffalo Center Chapter President Tom Tucker at the Buffalo AFL-CIO Central Labor Council Labor Picnic. Kowal and UUP’s statewide officers joined more than 200 unionists from western New York locals at the annual event, held July 26. Treasurer Rowena Blackman-Stroud and Membership Development Officer Edison Bond Jr. traveled from Brooklyn to be at the picnic, joining VP for Academics Jamie Dangler, VP for Professionals Philippe Abraham and Secretary Eileen Landy. The officers and members from UUP’s Buffalo-area chapters met and chatted with a number of Erie County lawmakers, including Congressman Higgins, D-Buffalo, a Buffalo State alumnus and former UUP member. Buffalo Mayor Byron Brown and county Legislator candidate Mike Schraft were also at the event; the Buffalo Central Labor Council represents more than 80,000 unionized workers in Buffalo and Erie County. 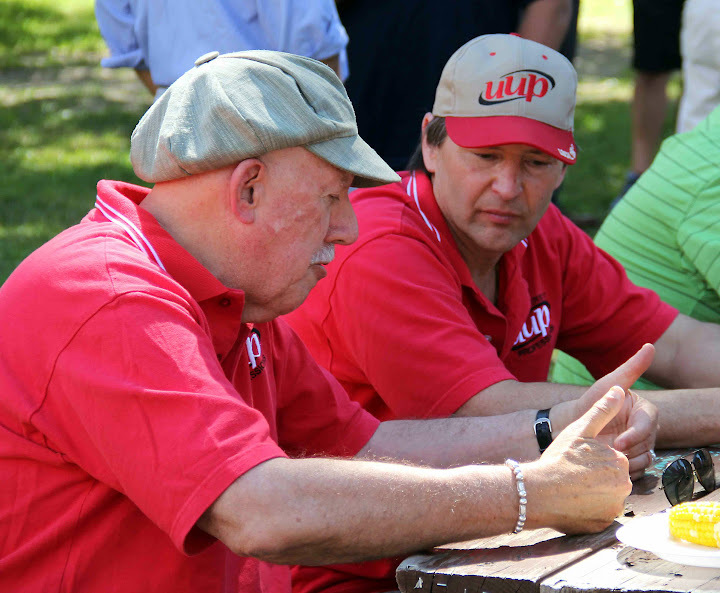 Kowal said UUP’s presence at events like the labor picnic is part of his plan to reach out to and create bonds with fellow unionists across New York state. For Blackman-Stroud, the picnic was a chance to enlist Buffalo-area unionists in UUP’s fight to save union jobs and vital health care services at SUNY Downstate Medical Center in Brooklyn. “We’ve got to recruit as much support as we can from our western New York brothers and sisters,” said Blackman-Stroud, president of UUP’s Downstate Medical Center chapter. Unions represented at the picnic included NYSUT, CSEA, PEF, the Communications Workers of America, SEIU and the United Steelworkers.